Our next Kare Bear Faire is on Saturday, December 2, in the ballroom, from 8:00 a.m. to 12:30 p.m., The faires are open to the public, so c’mon down! Browse, patronize or just enjoy the ambiance. Encourage your neighbors to join you! Join 45 outside vendors, who will offer their unique and innovative creations for sale. Watch battery replacements will be available! Also, purses made from cowboy boots, t-shirts, jewelry, leather goods, wood products, candles, sports earrings and necklaces (reasonable) and much more! The best part: bargains are accessible at the Kare Bear’s famous white elephant table! Innovative items that will delight…not bust your budget. A separate boutique table will be arranged with some collectable and specialty items for your perusal. 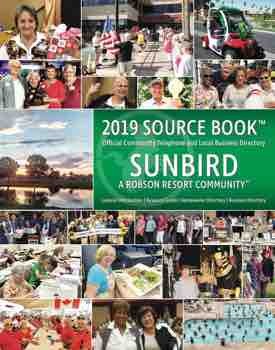 Thank you to our SunBird residents for your current donations—we appreciate you. Donations from the community are always welcome! If you require assistance or have questions, call Sherry Fann at (480) 883-1167. Our November KB Faire was awesome; we broke records for items contributed by residents. Thanks! A basket is always available at the membership table for donations of sample size hygiene products for the homeless. If you frequent hotels/motels, please bring unopened products to the meeting. Deanna then introduced candidates for the HOA Board: Marlene Scartozzi, Nancy Eckstein, Robert Moren, Linda DiPalma and Jean Pritchard. Ballots have been mailed and should have been received by this time. The candidates introduced themselves and expressed thei.ision and desire to serve our community on the Board. Honor the privilege of th.ote! Cast your ballot for the candidate of your choice. Christmas Wrapping Station: Watch for the date! Bring packaged and ready-to-go articles. KB’s members will wrap them for you. Donations of wrapping paper, ribbon and/or lots of scotch tape would be greatly appreciated. Don’t forget our Christmas luncheon on Wednesday, December 20. The spirit of Christmas is in the air as we partake in good food and good friends in the Kare Bears. Each KB: please bring non-perishable items, which will be donated to the homeless and food banks. There will be door prizes donated by members and outside sources. Mrs. Santa Claus will be there, as well as many other Christmas surprises. Share the yuletide spirit.